A Chinese delegation from Shanghai Municipal Government was welcome in Port Moresby last night. 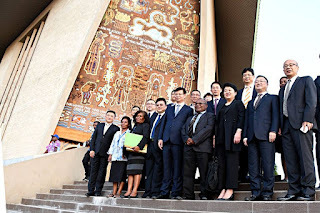 The delegation led by the Vice Mayor of Shanghai, Xu Kunlin, arrived in the country yesterday. It consists of business people from various sectors, including the head of Shanghai University of Sport, Li Yin, and Director General of Shanghai's Foreign Affairs, Zhang Xiaosong. The visit reciprocates Prime Minister Peter O'Neill's visit to China including Shanghai in May this year. The delegation met with several government ministers yesterday including Minister for Lands and Physical Planning Justin Tkatchenko, Fisheries Minister Patrick Basa and Minister Assisting the Prime Minister and Goilala MP, William Samb. Mr. Samb welcome the delegation to the country on behalf of Prime Minister Peter O'Neill. He said the visit will further cement the bilateral relationship between PNG and China. “China remains one of our number one friends and PNG respect China and its people, and we value that relationship,” said William Samb. The delegation's first visit was to the Butuka Primary School along Pari Road where a new Butuka Zhenshen Institute is being constructed. The project is being funded by the Zhenshen City in China, under a sister city arrangement with NCD, at the cost of 70-million-Kina. Once completed, the school will be named Tenzen Institution and will be opened by China's President Xi Jinping on November 15. The delegation departs tomorrow afternoon.